The time has come to tell the entire story of the creation of The Saint John's Bible. This completely updated and expanded edition of Illuminating the Word devotes a separate chapter to each of the Bible's seven volumes. Readers get a behind-the-scenes tour of the creation of each volume, with a fascinating window into the activities, challenges, and struggles at Donald Jackson's Scriptorium in Wales. We can practically watch, through the eyes of every artist and calligrapher who participated in the project, the Bible's stunning illuminations move from conception to completion. This edition also includes a completely new chapter on the scripts used in The Saint John's Bible that will fascinate calligraphers and lovers of the art. Still another new chapter details the production of the Heritage Edition, a high-quality, fine-art facsimile of the original that makes The Saint John's Bible available to a wider audience than the singular manuscript. Christopher Calderhead is a visual artist and graphic designer who has exhibited his letter-based works in the United States and Great Britain. He graduated from Princeton with a bachelor's degree in art history. In 1998 he obtained a master of divinity degree from Seabury-Western Theological Seminary. Ordained the same year, he has served parishes in the Church of England and the Episcopal Church USA. He is editor of Alphabet, a journal of the lettering arts published by the Friends of Calligraphy, and author of One Hundred Miracles (2004), a collection of miracle paintings by the great masters. "The design of this work befits the subject to which it is dedicated. The production makes it easy to use; even in its great size, the binding enables the user to let it lie flat for studious reading. A striking tribute and worthy companion to The Saint John's Bible." 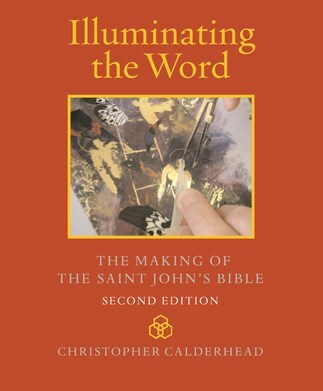 With flawless production values, Illuminating the Word: The Making of the Saint John's Bible is impressively informed and informative. . . . [This book is] very highly recommended for seminary, church, community, and academic library Biblical Studies reference collections and supplemental studies reading lists.